Cephalopod paralarvae and juveniles were sampled with light traps deployed at the surface and deeper in the southern NW Shelf and on Ningaloo Reef off Western Australia during two consecutive summers. One cross shelf transect (Exmouth) was sampled in the late spring and summers of 1997/1998 (summer 1) and 1998/1999 (summer 2), and a second cross shelf transect (Thevenard) and a longshore transect (Ningaloo) along the Ningaloo Reef were sampled in summer 2. Species captured in the order of abundance were octopods, Photololigo sp., Sepioteuthis lessoniana, and Sthenoteuthis oualaniensis. Most were captured in shallow traps except for Photololigo sp., which was common in both shallow and deep traps with larger animals found in deeper water. The presence of Idiosepius pygmaeus in deep water off Ningaloo Reef revealed the species to be eurytopic, inhabiting a wider range of habitats than previously known. Photololigo sp. and S. lessoniana were more abundant inshore, and octopods were especially abundant on mid-depth stations of the Exmouth transect, probably because of the turbulent mixing and increased productivity there. 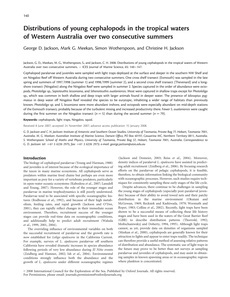 Fewer S. oualaniensis were caught during the first summer on the Ningaloo transect (n = 5) than during the second summer (n = 79).